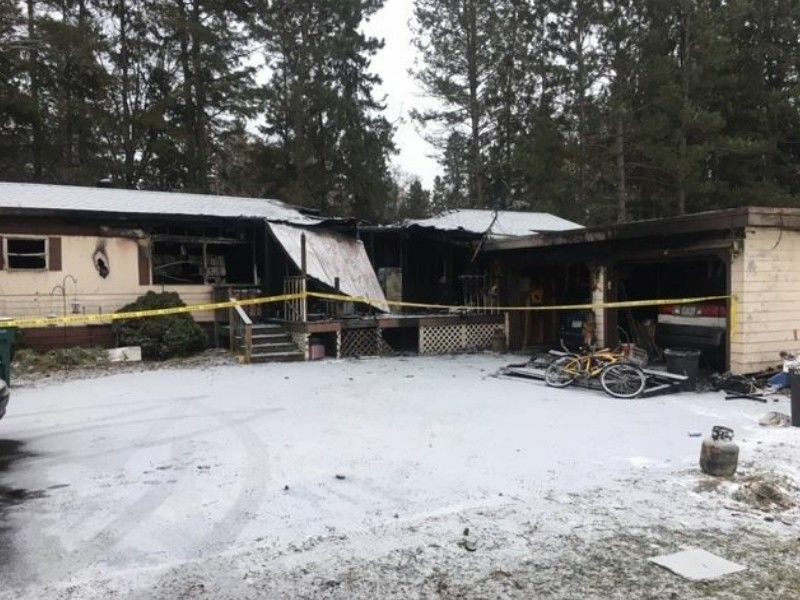 WASHBURN COUNTY -- One person is dead and two others are injured in a house fire, according to a news release from the Washburn County Sheriff's Office. (News Release) -- On November 29th 2018, at approximately 6:46 PM, Deputy Riedell heard Spooner Fire dispatched to a house fire at W8043 Carlton Rd in Evergreen Township. Deputy Riedell responded lights and siren from Hwy 53/Hwy 70. While en route Washburn County Dispatch Mutual aid requested Spooner Officer Trevor Peterson and Officer Austin Tucker. Deputy Riedell heard Dispatch say they were on the line with a female and shortly after had lost phone contact with her, however they could still hear breathing. The first officer on scene was Officer Peterson. Deputy Riedell and Officer Tucker arrived shortly after. Deputy Riedell observed the house was covered in smoke. Officer Peterson advised Deputy Riedell that there was no way in the front door. Through the windows on the West side of the residence Deputy Riedell could see the glow of a fire. Officers made their way to the East side of the house where the smoke and fire were less. Deputy Riedell was advised by Officer Peterson that he had broken a window on the porch but could not see inside because of the smoke. Deputy Riedell observed a door that lead into the porch. Deputy Riedell then kicked the door in, however it was being blocked by something on the other side once it opened. Deputy Riedell opened the door as much as he could, which was approximately 12 inches. Officer Peterson advised that he could see a person. Deputy Riedell got low and looked inside and saw another person that was a male. Both people were unconscious. Officer attempted to remove as much debris as they could to open the door however were unable to get enough out of the way to get the people out. Deputy Helbig arrived on scene. Officer Tucker retrieved a pair of bolt cutters from Deputy Helbig and Deputy Riedell retrieved a small shovel. Both then returned to the porch and were successful in getting the door off its hinges. At that point State Trooper Anthony Olson and Fireman Robert Wienbergen were at the door to assist. Once the Door was off, a male who was removed first and then a female. Both were taken to the road by Officers and then into the back of the ambulance. Both were still breathing but were unconscious. Deputy Riedell attempted to speak to the female to see if there was anyone else in the house, however did not receive an answer. The Spooner Fire Department and Shell Lake Fire Department continued to get the fire out. Deputy Riedell then spoke with a neighbor to the West of the residence that was outside. Deputy Riedell asked him if he knew how many people lived in the residence. He advised that as far as he knew there were three people that stayed there. Deputy Riedell was given the names. The Neighbor did not know the third person but advised he was a younger male. Deputy Riedell then requested Spooner Officers to go to the Spooner hospital to see if they could get any more information. Deputy Riedell relayed to the fire fighters that there could possibly be one more person inside. At that point the West side of the house was fully engulfed in flame. Once the fire was contained Deputy Riedell spoke with the Fire Department and inquired if they located anyone inside. Deputy Riedell was advised that Chief Vic was looking for him on the West side of the house. Deputy Riedell spoke with Vic and was informed that they located a body. The deceased was transported to Midwest Medical Examiner’s Office in Ramsey MN for an autopsy. The two injured are in critical but stable condition. The State Fire Marshal and Washburn County Investigators continue their investigation this morning. No names will be released.